Arterial Cleansing | Superior Fish Oil | UltraPremium Mega EPA+ - FOH Inc.
UltraPremium Mega EPA+ is a superior quality - verified by IFOS (International Fish Oil Standards), lemon flavored Omega-3 formula providing a high yield of EPA and DHA combined with 1,000 IU of Vitamin D3. Other Ingredients: gelatin, glycerin, water, ascorbyl palmitate, d-alpha tocopherol (as a preservative), natural lemon flavor. On average, in degenerative diseases like atherosclerosis or diabetes the benefits of UltraPremium Mega EPA+ take four (4) months or longer to materialize; however, the individual results may vary. However,, for measurable cardiovascular benefits, you should keep taking it for at least four (4) consecutive months; and you would need four (4) bottles of UltraPremium Mega EPA. Take 2 softgels twice daily, preferably along with CLAREVASA. However, for measurable cardiovascular benefits, you should keep taking it for at least eight (8) consecutive months; and you would need eight (8) bottles of UltraPremium Mega EPA+. Both Spark Pay and PayPal Express payments are NOT real-time transactions. Each order, including the shipping fee, is verified, then, processed manually. Upon successful payment, a detailed Sales Receipt is sent to customer's preferred e-mail address. 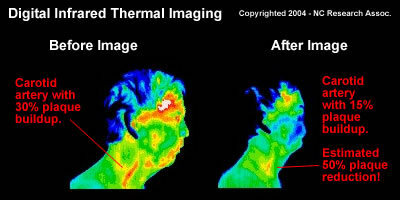 The picture on the left shows a high-tech digital infrared thermal imaging of a carotid artery of a man "before" and "after" the nutritional arterial cleansing. You can see an estimated 50 percent reduction of life-threatening arterial plaque buildup in the carotid artery as a result of a six-month trial of the nutritional arterial cleansing. © 1998-2018 Reverse Atherosclerosis. 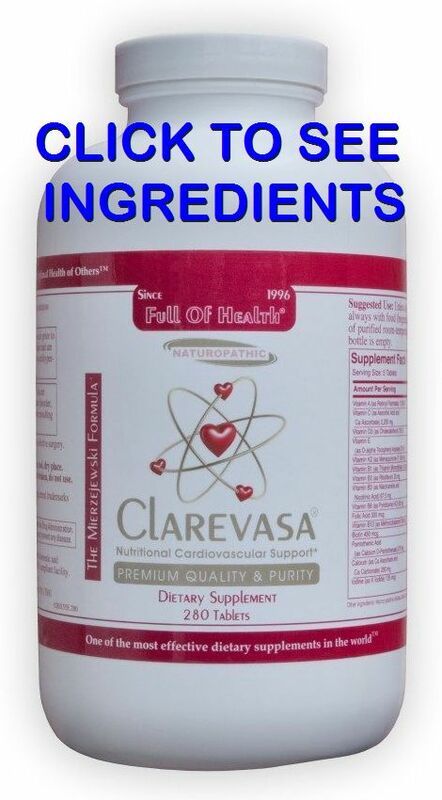 com: Arterial Cleansing | Clarevasa Formula. Unclog your arteries withut drugs or surgery. All rights reserved worldwide. This document may not be copied in part or full without express written permission from the publisher. The information on reversing atherosclerosis naturally provided herein is a general overview on this topic and may not apply to everyone, therefore, it should not be used for diagnosis or treatment of any medical condition. While reasonable effort has been made to ensure the accuracy of the information on the nutritional arterial cleansing, Full of Health Inc. assumes no responsibility for errors or omissions, or for damages resulting from use of the information herein.